Most people avoid the Hudson River at all costs. Unless you’re commuting on a ferry, there is absolutely no reason you’d want to get close enough to that body of water for fear of immediate contamination of some sort. But, when I got an invitation to try biking on the river I was intrigued. While I’m certainly not a fan of biking in New York City, biking on the water meant zero chance for taxi cabs and tourists inadvertently (giving them the benefit of the doubt) knocking me over. (Then again, there was a new threat of possible body parts getting stuck in my chain. But dead bodies trump live bodies when it comes to my safety standards so I opted to give it a shot.) 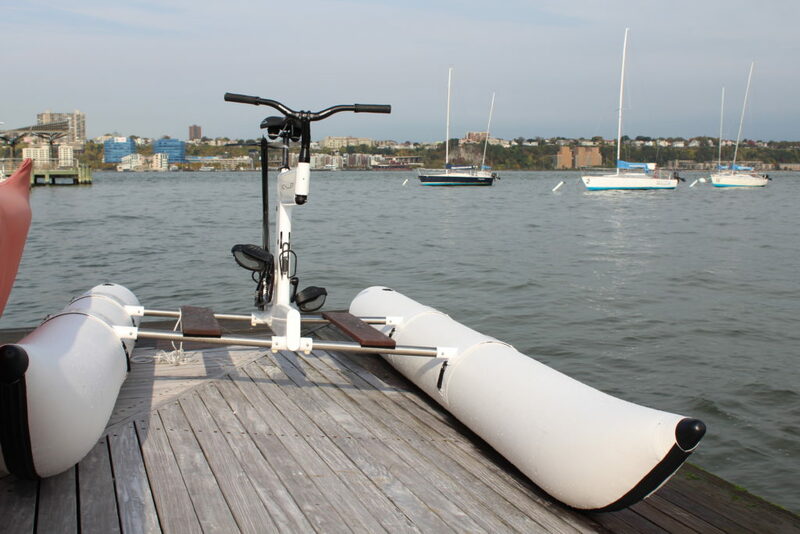 Judah Schiller CEO and founder of Schiller Bikes, a new and revolutionary line of water bikes, met me at Pier 66 in Manhattan and took some time to explain the wild (yet somehow chic) contraption. “The bikes are sleek and elegant, but high tech,” he told me. “It uses an optimized propeller, proprietary gear box and Gates Carbon Drive belts. Its handlebar controlled proprietary steering mechanism, directly turns the propeller which is mounted on the low drag Schiller outdrive unit.” All of that is just fancy talk for a floating island that I was promised, could not flip over and was so safe I didn’t need a helmet. 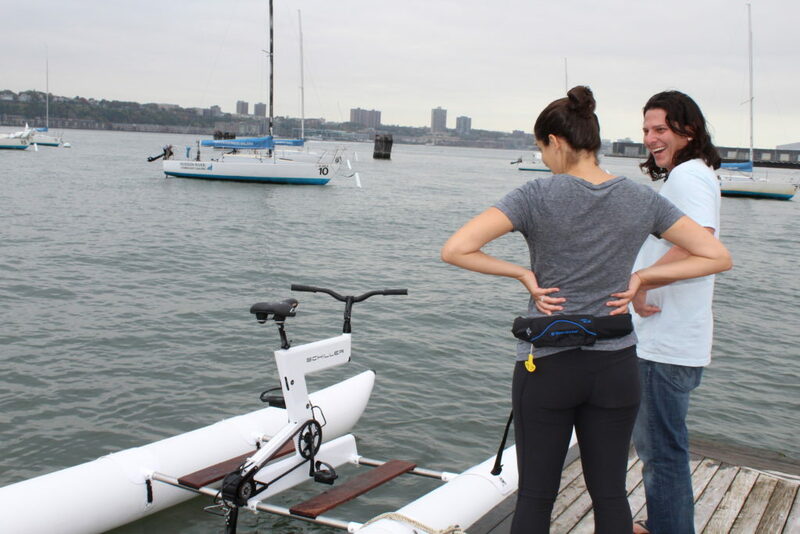 “So, no one has ever fallen off one of these things?” I asked one last time before stepping on the part bike, part catamaran looking thing. “No, no one has fallen off. These have even been taken out in the ocean with actual waves.” Entirely (ok, almost) convinced, I stepped on, sat in the saddle, put my feet on the pedals ... and I was off! It felt very strange at first — the sensation was of being on spin bike with a road bike's ability to turn combined with the resistance of boats' wakes against my efforts. The handle bars are actually controlling a rudder in the water that only spins while you pedal, so it took some real power to avoid being pushed into a pier by the currents. But, as I kept cruising, I got more comfortable making the turns. I also got a bit sweatier. This thing was actually kind of a workout! “It’s engineered to harness the maximum amount of human energy into speed on the water,” Schiller told me after. “It’s a totally new fitness platform.” After doing one loop, I was hooked. I asked to take another spin around the harbor, this time with more confidence. My turns were crisper, I tackled the wake of passing boat with ease, and even waved hello to the friendly girls I asked to document this bizarre experience. Normally, I would never think to take a hand off my bike on the road, but here I was able to take both hands off if I wanted. “You can actually jump off the bike entirely and go swimming if you want,” Schiller added speaking about destinations where one might consider getting in the water. “We’ve even had two people go on at a time; someone pedals while the other chills out.” My couple of spins around the water were actually more fun than I imagined, though, they also came with about the number of pedestrian stares I’d imagined getting. Yet, I had to know: How the heck did Schiller come up with this idea? 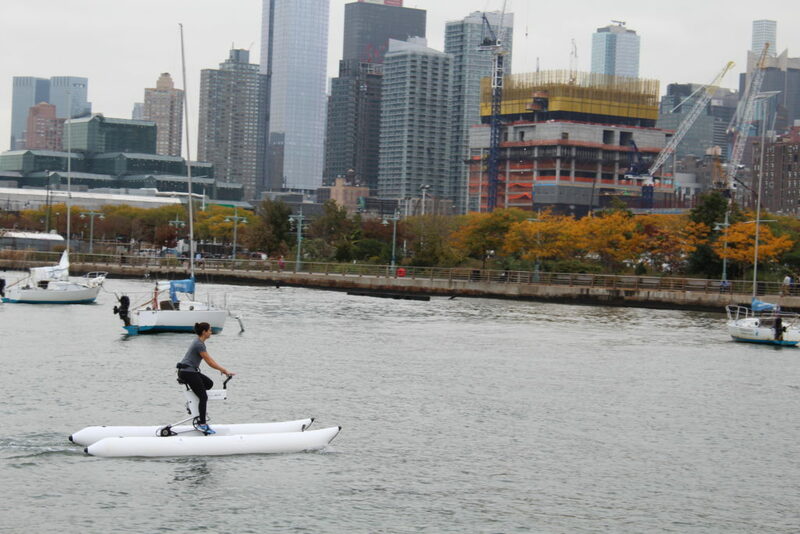 “I did this crazy stunt three years ago where I biked from Hoboken to Chelsea,” he said. “I thought, why drive all the way to the GW Bridge and drive back down to just come to work, when you can bike across in 10 minutes.” He added, “I got obsessed with the idea of biking across a body of water. I ended up having so much fun, that the whole exploration of fitness side emerged. There are 1 billion bikes made for land, on a planet that is more than two thirds water.” Hmm. I thought. Maybe the idea isn’t crazy at all. It could actually be genius! Though water biking hasn’t caught on in terms of a commuting alternative, it is picking up steam in destinations all over the world. “We launched in 2014 and now we’re everywhere: Hawaii, Germany, Australia, Costa Rica, the French Alps and more,” said Schiller. “You can rent one of our bikes at a number of locations for a trailblazing voyage, weekend expedition, scenic sunset spins or a workout.” And while I don’t think I’ll be trying to cram one of these in my studio apartment any time soon (it is possible to purchase one of these bikes for personal use) the guy did convince me this might have a bigger future than I originally thought it would. “I think this will be an Olympic sport in the future,” Schiller said confidently. “Just you wait!” Anyone want to start training for the 2020 U.S. Olympic Water Biking team?